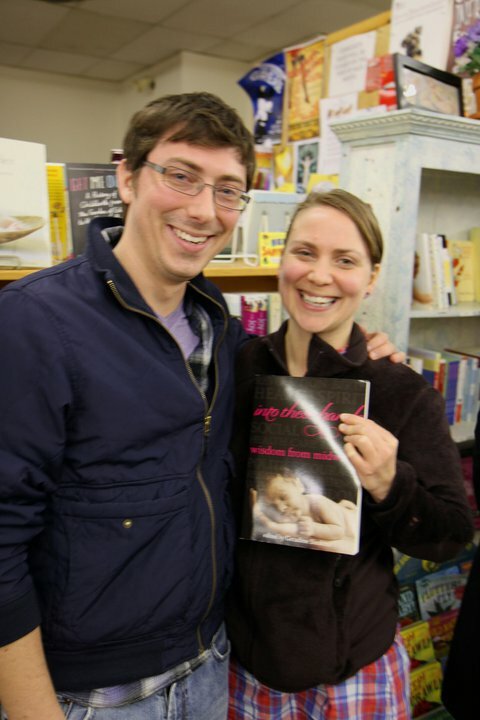 Leah & Sean unexpectedly discover their mother's book in Chicago bookstore! So two of my kids, Sean and Leah, went to a literary event for their friend Jacob Wheeler in a local bookstore in Chicago where he was sharing his newly published book, Between Light and Shadow, on adoption in Guatemala. Don’t you think Sean and Leah were surprised when they discovered a display that included their mother’s book staring them in the face? I think the looks on their faces say it all. It is a thrill to have my own newly published book out in the world. People from various parts of the country are emailing me to say, “I was surprised and pleased to see Into These Hands in my local bookstore.” For those of you who want to spread the word about midwifery and the excellent care provided by midwives, perhaps you’d consider donating a copy to your favorite bookstore or library in your hometown. If you are a midwife include your own business card or some of your literature in the book. It is a form of advertising. You never know what could happen! Try it and see.